You need a new lock. Maybe you need a few. Chances are you are going to go to a big box store in your local area. And there is a good chance that the store you end up at will be Home Depot. So you park your car and walk into the warehouse size store. Then what? What are you looking for? There are all kinds of locks all over the store. Some look very different than others. Do you just need to find your same type of lock you already have and be on your way? How do I know what is good and what isn’t? 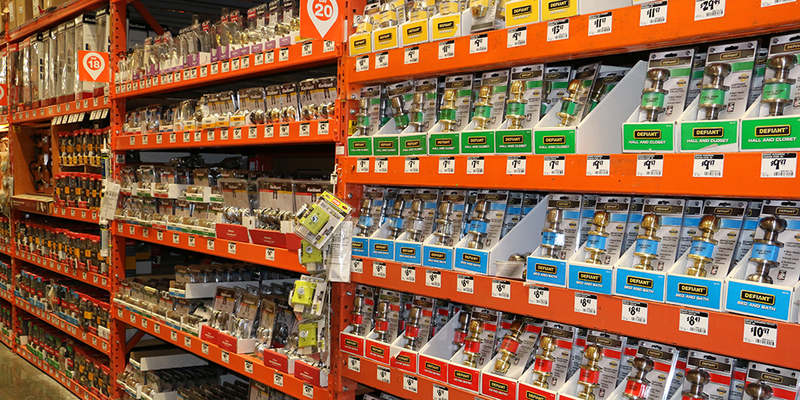 In this post, we will be talking about what you need to look for in your Home Depot lock purchase. Keep in mind that some of the finer points of selection may vary depending on the specific store. To combat that, we have some general information, and some slightly more specific general information. Take your time, and make sure that you don’t rush to a decision that can compromise your security. You want a good lock. No, you want the best lock you can get. Well, not the best lock, because that one is too expensive. If you don’t care about getting a good lock then you really don’t need a lock at all. But you do care and you do want a lock, so you go down to your local Home Depot. When you are at the store making your decision, there are going to be several things you need to do. Read the fine print, and read between the lines. Some locks will advertise as having a numbered security rating. These types of ratings are ultimately meaningless to the average consumer. The methodology for the third party testing is obscured, and the findings often conflict with the reality of the product’s protection. When it comes to security, you get what you pay for. A larger initial purchase will almost always ensure a higher level of security. The biggest exception to this trend is when a lock has a bypass that the company refuses to invest in finding a solution for. This could be for many reasons, but the most common is money. A high price can also be deceptive if the product includes electronics. Smart locks are going to be very expensive, but they are not necessarily more secure than a standard manually operated lock. You need to understand what cost is being passed down to you. Ideally, you want to be paying for security pins, solid construction, and stronger materials, because that will decide your level of protection. Knowing a brand is not the same as knowing that brand’s track record. Unfortunately, brand awareness does not always transfer over to quality. Some of the most “trusted names” in the industry make some very insecure locks. I hesitate to say “the worst” because off brand locks tend to be pretty horrible as well. Schlage is one of the few exceptions to this trend. They are not the best locks, but they offer better hardware construction and picking resistance than a company like Kwikset. If it is not a name you recognize it is for one of two reasons: it is cheap or it is expensive. If it is cheap, then it is most likely made in China with shoddy craftsmanship and weak construction. If it is expensive, look up the brand, but chances are it is a brand whose price makes the locks too exclusive to build brand awareness. Brands like Assa-Abloy, Evva (a nearly unpickable lock), and Medeco are not household names. Mul-T-Lock you may have heard of or, at least, seen the logo, but none of that matters. As we will discuss, it is not about the name, it is about how the particular lock fits your need. These are the types of locks that will be on the front of your home. Your doorknob (at least on the front door) will be keyed. In addition to a keyed in knob cylinder, you should also have a deadbolt. A deadbolt can either be double sided or single sided. For a front door, it will make sense to have a single sided deadbolt with a thumb turn, this will help increase the effectiveness of your front door security. If you have glass or windows on the door, or in close proximity to it, the best option will be a double sided. Once you have installed a double sided deadbolt you must consider that door a wall. In an emergency situation, it will require the time-consuming task of retrieving a key, preventing any type of quick escape. Successful Installation – First of all, you want to be able to install the product successfully. You can take care of this yourself or seek the help of a professional. A professional locksmith is always available to help with new lock installations and they will also give you some handy security tips. If you choose to do it yourself, or would simply like to remain informed about the service you are purchasing, take some measurements from you door and locks. If you currently have a mortise lock on your front door, then you will most likely want another mortise. If you plan to change from one lock type to another, be sure that you understand the work that is required. To keep with the mortise example, if you want to change to a keyed in knob cylinder you will need to fill in the pocket of drilled out wood. Save Money Without Compromising Quality – The best way to make sure you are not breaking the bank, but you are still getting the best product, is research. Product comparison will help get to the root of why a particular lock is more expensive than another. Beyond product comparison, find out what you really need. If the bolt work is functioning perfectly, then you may only need a new cylinder. A new cylinder will be cheaper than buying all new hardware. This also goes for installing the product yourself. Self-installation is a good way to save money if you have the time and skills necessary for the job. Practical Security – The lock should not be so easy to pick that anyone that has seen a video on raking can open it. The level of pick resistance is dependent on how big of a threat you believe lock picking methods are in the area you are installing the lock. When it comes to hardware, the metal should be strong, and the construction should be solid. The heaviness of the device will be a good indication of both those factors (the heavier the better). That goes for the lock as well as the strike plate that your bolts will extend into. You do not want your lock being defeated by a single well-placed kick. Research – Where you get your information from is very important. Look for video documentation. If you can see the product being used in real time, then that is a good sign. Better yet, if the lock is taken apart, you can trust that the review is accurate. For documentation of the locks internals, search the lock you are interested in and the term “gutting” or “gutted”. This is often used for describing the process of taking apart the lock, and may be used in conjunction with a picking attempt. Finding videos of professionals rekeying locks will also provide you with visuals on the lock’s internal workings. Try and find a video of the product being installed as well, to gauge how difficult it may be. Choosing Price Over Quality – You do not want to choose the cheapest lock on the grounds of it being the cheapest lock. This mindset will ensure that you are not getting the best lock for your home. It is fine to try and save money, but this should not be the end goal. The end goal should be to have effective security protocols in place. The price point is a plus, and may be a factor, but it is not a good deciding factor. Mixing Purposes – The lock that you buy should be for practical application or picking practice, and never both. Choosing your application is very important because picking the lock (or attempting to) over and over will weaken the mechanism. Bad Information – If you are buying a product because you saw an advertisement for it, then chances are the information you received was biased in favor of the company. If the employee that is selling you the product, cannot answer a question without looking at the box, then chances are they are not the expert you need. If they are only referring to the box for specific information, then this is not a red flag. Knowing a bit of information ahead of time will help you determine who is misleading you. When you are being lead astray, it may be the result of an honest attempt to help, and the person may not understand that they are misinformed. Bad information is not always malicious. A padlock is historically defined by its ability to be removed from what it is securing. Nowadays a padlock can be recognized by a shackle and a lock body. They may have a dial, a wheel combination, or keyway, but a padlock is a padlock. If you can take the lock with you after you open it, then you have a padlock. The type you want will depend on what it is you are securing. There are all kinds of things to consider based on your personal needs. Fit to Size – The most important knowledge you need for buying the right padlock is what you will be using it for. Measure the distance you have to reach in order to secure the lock. You want the closed shackle to be tight around whatever type of hasp, or similar securing point, the lock will be placed on. A Strong Support – If this lock is going to go around a chain, hasp, etc. you want to those items to be as strong as your lock. A weak support system for your padlock will undercut the effectiveness of your lock. Also, take a look at what your chain or hasp is secured to. The anchor points, whether they are posts or gates, must also be secure. 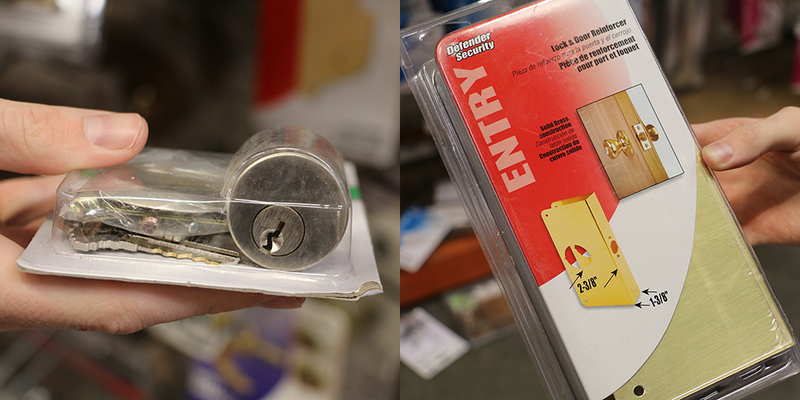 A Fairly Priced Lock – In this case, “fair” will depend on what type of item is being secured. For example, the padlock on a child’s bike does not need to be as expensive as the lock on a vintage Harley Davidson. The more you spend, the better the padlock is going to be (within the confines of the lock manufacturer’s ability). For something you really want to keep the minimum price you should spend on a padlock is around $100. [FIND OUT IF THAT IS EVEN POSSIBLE AT HOME DEPOT]. Ball Bearings – You can tell if a padlock has ball bearings by opening the shackle and looking for circular grooves. The packaging might also mention if the product has ball bearings. Ball bearings afford you protection against shimming, which is a bypass method that anyone can perform with an aluminum can and a pair of scissors. Drill Protection – Drill protection will vary in effectiveness, depending on the material that is used. The bare minimum protection is hardened steel. This steel can be used on an anti drill plate, or pins in the lock. The idea is that the material which is “anti drill” will be harder than most basic drill bits so that these attacks will glance off the lock. Cutting Protection – For cutting attack protection you need, at the lowest security, hardened steel. Better than that is some form of alloy. And still better than that is an alloy with ceramic inserts. This type of protection should be used in the shackle as well as the lock body. Using a shroud will also help to protect the shackle. A shroud can be located protruding from the lock body to cover the sides of the shackle. Weather Resistance – If the lock is going to be left outdoors for long periods of time and exposed to different temperatures/weather, it is a good idea to purchase something with weather resistance. This may come in the form of a plastic casing, drain holes, etc. If there is the danger of dust and dirt being kicked up into the lock you may also want something with keyway shielding. A General Purpose Lock – Attempting to purchase a general use padlock is a good way to harm your security. Nonspecific plans will get you a lock that leaves you unprepared. A shackle that is too short will not close, and will therefore not secure your possession. If the shackle is too long this will give a thief leverage to attack the lock, chain, or hasp more directly. The easier it is to directly attack your security, the worse your security is. Cheap Locks – Padlocks that are cheap are cheap for a reason. That reason is the company has not invested in the types of protections that a sturdy padlock needs. That is still no excuse. Most big name lock manufacturers could decrease their profit margins to allow for better quality locks, but this is not what they do. Low prices, especially with padlocks, means low security. Redundant Models – If you are going to be using more than one padlock, do not get duplicate models. Once a weakness is found in one of your locks, this can be exploited to defeat the rest of your security. Even if you believe that you have found the single greatest lock in the world, using two of them does very little for your security. Variety in your security is a much stronger than repetition. When you first go into Home Depot it can be overwhelming. The store is as large as a warehouse. Things are also very spread out. There are two different lock sections. Lock cylinders, keys, rekeying sets, latch bolts, and padlocks are all in one aisle with the key cutter. The sign details that there is cabinet hardware, nails, and locksets. If you are looking for door locks, you can stumble upon any of the three brand specific displays. There is one for Kwikset, Schlage, and Defiant. Each section only has that one style of lock with a set of knobs and a deadbolt. They may have a couple finishes to choose from, but other than that you will need to go to the door section if you want a bit more choice. And I do mean a bit more. When you get to the door section you will be introduced to the option to purchase some electronic locks and smart locks. The only new brand this discovery will afford you is Baldwin. 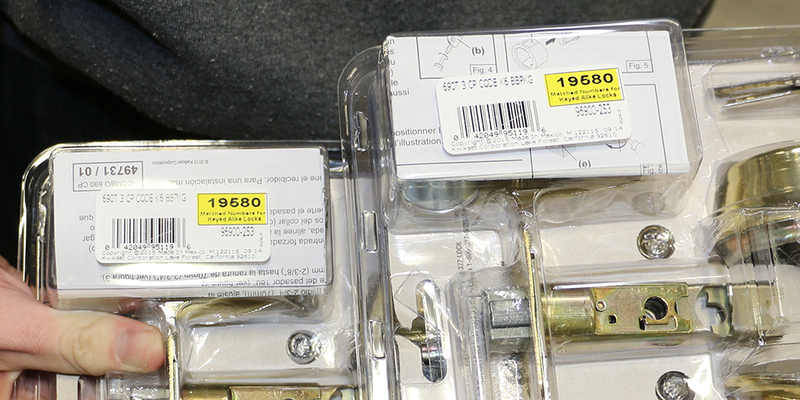 We also start to see quite a few SmartKey cylinders from Kwikset. I can not stress this enough, DO NOT purchase a Kwikset lock with a SmartKey cylinder. You may have seen some propaganda commercials on the internet where locksmiths try and pick the SmartKey. It is hard to pick, no doubt. Bumping it is also very difficult (I have yet to see documentation of a successful bumping attack). But there are simpler ways to overcome these locks with no knowledge of how the mechanics work. With just a key blank, a screwdriver, a hammer, and a pair of vice grips and you can open any door with this lock. This warning extends to the Kevo, which despite having a display for, there was not even a section I could find where they stock it. At this point, we have four brands to choose from. There are some electronic locks, but other than that the choice is to buy one of these brands as a deadbolt, keyed knob, or both. Out of the selection, it comes down to Schlage and Baldwin. Don’t get me wrong, both of these locks are not great. In fact, they are pretty far away from the security of something like Mul-T-Lock, Evva, or Medeco. Both use Schlage keyways, and though Baldwin used to have a better reputation for better high-low bitting on their keys, that has fallen out of the present and into lock and security history. In the hierarchy, there is a pretty close tie between Schlage and Baldwin, then Kwikset is worse, and then Defiant is going to the lowest quality. When I talk about quality I am talking about the construction of the hardware and the security of the cylinder. If you just pick up a Schlage and a Kwikset you can feel the weight difference. The extra weight you feel in the Schlage is solid construction with metal components. 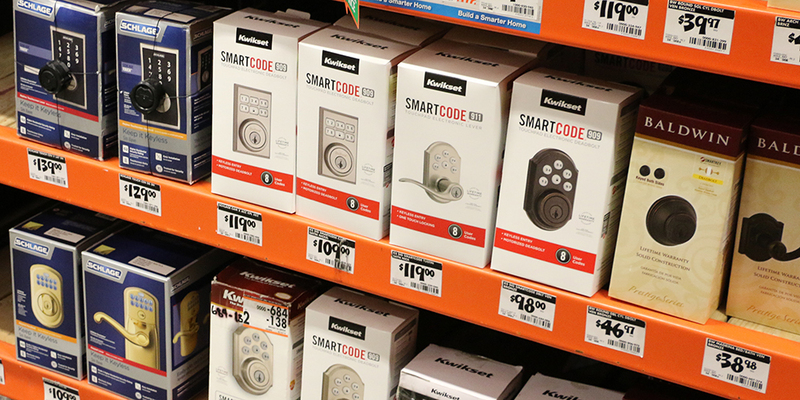 The Kwikset uses less metal, and in the case of the SmartKey, plastic. In order to bring these low prices to the general consumers, cuts need to be made somewhere. When it comes to security, cuts are bad news to the person seeking protection. Less metal. Less, and in most cases, no security pins. The level of intricacy in the cylinders is inconsequential if not nonexistent. The amount of attention paid to the biting will decrease. Also, pay attention to keyed alike codes. Take two Kwikset doorknobs for example. One on the right, and the other on the left. I pick up both and find that they have the exact same key code. This is done for customer convenience. If you want all your locks keyed the same (bad move), then it is simple to find some with the same keys. More bad news for you is that anyone buying a lock that day has a pretty fair chance of ending up with the same key you have. As unfortunate as this may all seem, it is still important for people like new homeowners to look into having their locks changed or rekeyed. When it comes to padlocks you have far fewer options than you do with door locks. In all, you have two choices, “Master Lock or no lock at all”. It is by far the most difficult choice to make. On one hand you will have no protection, and on the other hand, you can save money by not buying a lock. To answer your question, “Yes. Master Lock is that bad.” Much like the door lock section, all they have is the cheap stuff. Unfortunately, the cheap stuff is the most insecure stuff. Whether you are getting the most expensive locks, which are the truck door lock and the mounted lock box, these things are pretty terrible. 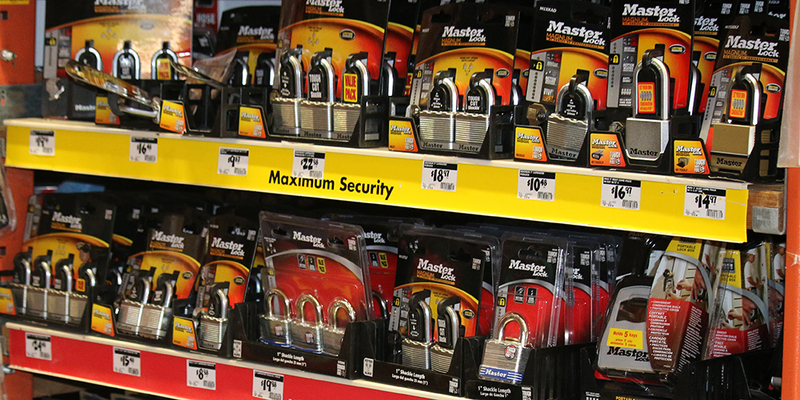 And in terms of price variation, Master mainly offers varying amounts of Master padlocks. This is another bad idea. If you get 5 of the same lock, then there is no diversity in your security. The same attack that works on one lock will work on all of them. For something you really care about, you want to spend at least $75 to $100 dollars on the padlock protecting it. Out of what they had at Home Depot nothing even came close to the quality that would deserve that price, and Master Lock agreed because the most expensive lock was under $30. 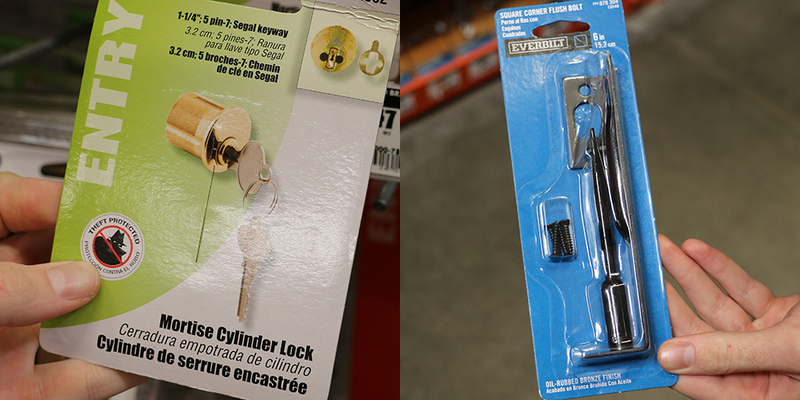 If you bought your lock from Home Depot, then Home Depot can cut you a key. I will give it to them that they have quite a diverse selection of key styles. And when I say key styles I am only talking about the images on the keys. In terms of the graphics you can have on the key, there is everything from Frozen to M&M’s. In terms of the keyways, they fit Kwikset and Schlage. Their key machine shows a car key (for replacing car keys) and a house key, and it is a code machine, so this leads me to believe that it can cut car keys (I could not find anyone to ask). My speculation would be if it does cut car keys, then I would guess you need to have purchased the proper key blank because I did not see any car blanks around (they may keep them locked up). Kind of hidden in that section there are rekey sets. These are perfect for rekeying a Schlage or a Kwikset lock. You will need a different set depending on the brand. With these kits, you have instructions, new keys, new pins, and the proper tools. In the same section as keys and padlocks, there is all the other miscellaneous lock gear. There are sets that will strengthen your door, replacement rim cylinders, latch bolts, and mortise cylinders. In the case of the store, I went to, if you can’t find it in this section then they don’t have it. The organization can be pretty overwhelming. Everything is just kind of on top of everything else. Upon really analyzing it, the organization is not that crazy. There are all kinds of different latches right above peepholes, which are right above strike plates. It is very much the additional lock supplies section. There are products that would add more protection to your doors, or at the very least the appearance of more protection. The so-called chain door guards are not going to stay intact after a firm kick, but a rubber band can also do the trick. The U-bar latch is also pretty insecure, and the hardware securing plate they have is made out of brass. Brass lines up on the Rockwell hardness scale with aluminum and soft steel, so it is fine but not great. Anything you get from this section is going to give you a minor addition to security. The cylinders will save you money, as long as you don’t care about having a very low-security cylinder. Overall this was very underwhelming. In my experience, and this might be a regional thing, the only task that is harder than finding employees is an employee that can answer your question. In the case of this particular excursion I was looking for mortise cylinders. I had found rim cylinders in the Miscellaneous section next to the padlocks, but I wanted an image of their mortise cylinders. I knew they had them because I had bought one just a month ago. However, when I was buying it, a colleague of mine had brought it to me, so I did not see where he got it. Spectacularly there was a gentleman who saw my confusion and frustration and he asked if he could help me. I asked where the mortise cylinders were. He needed further information. I explained that it was a replacement cylinder for a mortise lock. This did not help, so I explained that a mortise lock often has the bolt work in a rectangular box and fits into a pre-made pocket, or mortise, in a door. The cylinder was the locking mechanism that used a rotating cam as an actuator for the bolt work. It was also threaded, unlike a standard rim cylinder. I explained that if there was a section with mortise locks then that would most likely be where the cylinders are. This prompted him to take me over to the hinge section of the isle. He handed me a square corner flush bolt. As you can imagine these are not at all similar. I can only imagine what he would have given me if I had less information to give him. No, I did not want a bolt at all. After asking me to tell him if I found it because he would like to know what it is, this man left. I returned to the section where I had found the rim cylinder and was so sure it should be there. It was. It had been staring me right in the face. The packaging obscured what it was, but clearly said mortise cylinder lock. So in all, very overwhelming presentation to the point where an employee looking over my shoulder could not help me. I never found that employee again. I would have liked to show him what I was talking about, as well as ask him some questions about the key machine. Would he have been able to answer my questions? Well, I had a friend that asked him if the “Laserkey” used lasers to cut the keys. The man said, “Yes.” The correct answer is, “No.” There are no key cutters that I am aware of that use actual lasers. I am not sure where you can find answers in Home Depot, so if you have any questions go ahead and ask them in the comments section below. 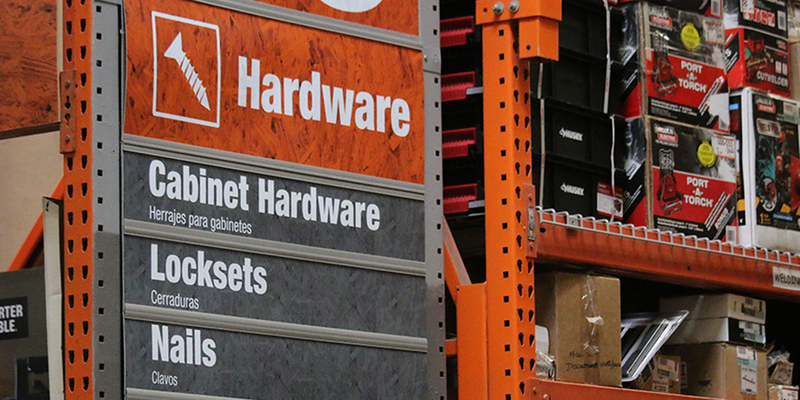 After really considering your options and finding out exactly what you need, there is a good chance that you will be leaving Home Depot empty handed. But do not let that get you down. Leaving with nothing is much better than buying something that doesn’t really help you. Be sure that you do find the equipment you need (there is always the internet). I would love to know what types of locks people are finding at their Home Depots, and exactly how much of a difference location makes to your selection. Hopefully, you were able to find some useful insights in this post. For any specific questions, feel free to leave a comment below. If you ever need any help with lock installation and/or damaged lock repair, never hesitate in contacting United Locksmith directly. Other than that, we have Twitter, Facebook, and Tumblr to keep you up to date on the most recent Lock Blog posts. Alright, enough will the shameless self-promotion that everyone stopped reading about three plugs ago. Take your time, and make the right decision.